A finch is any of the many species of birds that belongs to the taxonomic Family Fringillidae. They are perching birds and song birds. The finch has become an icon of evolution, having been used as an example of speciation and natural selection by Charles Darwin. Best known for their specialized beak, which differs based on their food source. Finch can be divided by shapes of beaks. A finch has the same basic body parts as other birds: a head, a body, two wings, two legs, and a tail. Also like other kinds of birds, a finch is covered with feathers. There are many different colors and patterns of feathers. The basic color of finches is brownish or greenish with some black, and white generally absent except as wing-bars or signaling marks. The most significant characteristic of finches is that they have strong and steady beaks. Some finches might have huge beaks and others might have small beaks. Finch size ranges from 3" to 8". It may be difficult to distinguish between the female finch and the male finch. A small difference is that when they stand next to each other, male finch is a little bit taller. When people think about the finches, the first thing that they will notice is the finch's beak. A finch usually has a strong, hard, and steady beak. People can distinguish the finches by their beaks. Beaks are usually used for their food. They usually open the seeds with their beaks.Also finches can use their beaks for eating insects and pecking woods. Each finch has different shape of beaks. If one finch usually eats seeds or nuts, it might has a big and hard beak. If other usually eats insects, it might has a slender beak. Finch are songbirds, which use vocals for many purposes. Although generally quiet birds, finch use vocalizations to communicate with others and warn of predators. Male finches use theirs to protect their territory and attract female finches. 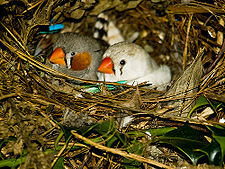 Finches breed when the female is over one year old and the male is under five year old. They have to be at least eight months old before they start to breed. Also they have to be healthful and well fed. When the finches mate, the female finch will try to attract the male finch and ask for food. The male finch will put the food into the female's mouth. During the mating season, the male finch will carry branches or sticks around to build their nest because to lay their eggs, they must build their nest first. And then, the female finch will lay the eggs in there. Unlike other birds, the male finch will try to defend the female finch instead of protecting their territory. When they have successful breeding, the female finch will lay between one and ten eggs. Reproduction of finches are related to rainfall. So they reproduce many times in the year. Finches usually stay in the egg for two weeks. After two weeks, they hatch from the egg. When they just hatch from the egg, they cannot see anything. They are most likely blind. When they are born, they only think about their parents because they have to stay in a warm place and they also have to be fed. Finches will leave the nest when they become almost three weeks old bird. When they are grown up, they will start to get ready for their migrations. Usually, finches migrate to the south in fall. In the spring when the weather gets warmer, finches come to the north and get ready for the mating. Some finches migrate when the food is needed. Others do not move at all. 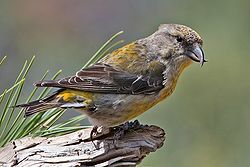 Finches are usually found in America, Europe, Asia, and Africa. They like to live around forests,shrubby areas, savannas, gardens, grasslands, and agricultural areas. Sometimes they are found on mountains or deserts. They usually live in the nest. When the female and the male finches get ready to breed, they build a basket- shaped nest. The female finch will lay eggs in the nest. It will also heed her finches. Nests are usually made of grasses, twigs,and, leaves. Finches can be distinguished by food. Some finches eat the insectsand, the others eat the woods, seeds and plants. Also some of other finches eat the ticks from other animals. The size that the largest finch can actually reach is 23cm (9 inches). It will weigh around 79 grams. The name of the largest finch is Mycerobas affinis, Collared Grosbeak. It usually lives in South -East Asia. The Size that the smallest finch can actually reach is 9.5cm. This finch will not grow larger that that. The weigh is up to 8.4 grams. The name of this smallest finch is the Andean Siskin (Carduelis spinescens). The waxbill family (Estrildidae) look alike to finches that sometimes they have the word finch on their common name. The beak evolution of Galapagos Finches ("Darwin's Finches") helped Darwin postulate his theory of evolution through natural selection. Recent research has determined that climate change can stimulate remarkable adaptive change incredibly fast - in just decades - a process which turns out to be surprisingly complex as noted by the following article in the journal Science. 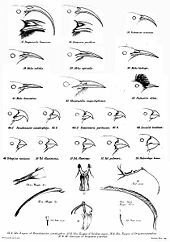 Although the variations in beak size that Darwin witness demonstrates microevolution, it does not offer the support needed for macroevolution or common descent to be true. Furthermore, the changes observed in finches occur over short spans of time that is more supportive of creationist predictions of rapid diversification since the flood, rather than evolution through mutations over millions of years. ↑ Evolution on Fast Forward: Finches Adapt to Climates National Geographic Today, January 10, 2002. This page was last modified on 4 August 2015, at 13:02.